Detects caveolin-2 from rat tissues. 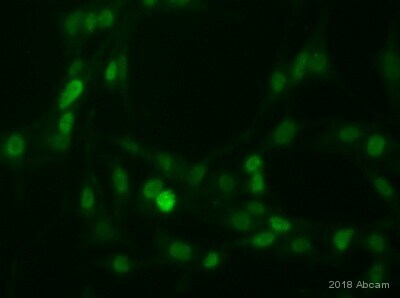 This antibody does not detect caveolin-1 or -3. Synthetic peptide corresponding to Rat Caveolin-2 aa 1-19. Our Abpromise guarantee covers the use of ab2911 in the following tested applications. WB Use at an assay dependent concentration. Can be blocked with Caveolin-2 peptide (ab4929). Can be blocked with Caveolin-2 peptide. Western blot of caveolin-2 on rat skeletal muscle protein extract using ab2911. 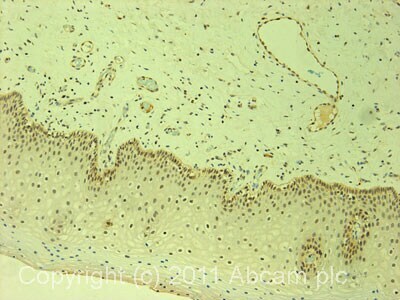 IHC image of ab2911 staining in human normal cervix formalin fixed paraffin embedded tissue section, performed on a Leica BondTM system using the standard protocol F. The section was pre-treated using heat mediated antigen retrieval with sodium citrate buffer (pH6, epitope retrieval solution 1) for 20 mins. The section was then incubated with ab2911, 5µg/ml, for 15 mins at room temperature and detected using an HRP conjugated compact polymer system. DAB was used as the chromogen. The section was then counterstained with haematoxylin and mounted with DPX. Publishing research using ab2911? Please let us know so that we can cite the reference in this datasheet. 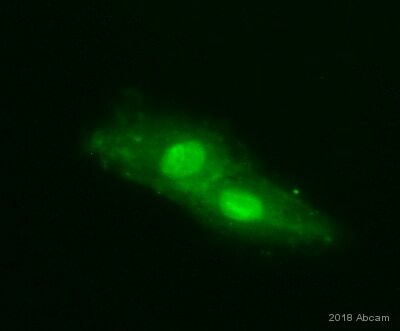 Our customer purchased ab2910(lot#GR54402-1), ab2911(lot#GR11226-5) and would like to know KD values of these antibodies, respectively. I am sorry to confirm that regrettablythe KD values for these two antibodies, ab2910 and ab2911, has not been assessed and so we are unable to provide this information. It is unusual for the KD values to be assessed for research grade antibodies. We aim to provide as much information as possible and I am sorry this is not possible on this occasion. If you have any further questions, please do not hesitate to contact me. Recently, I purchased rabbit caveolin-1 polyclonal (ab2910) and rabbit caveolin-2 polyclonal (ab2911). caveolin-1 worked beautifully using cell lysates derived from an immortalized human endothelial cell line. caveolin-2 was completely absent, which is a little surprising since the literature suggests that caveolin-1 and 2 are co-localized and highly expressed. What would you suggest as a positive control? Do you sell the immunizing peptide? I also noticed that the paper you reference for anti-caveolin-2 (JBC 272:29337-29346, 1997) did not use the polyclonal antibody you sell. Would you have the correct reference for this particular antibody? According to the datasheet, rat heart and skeletal muscle was used to test this antibody, so you can use it as positive control. We are sorry but we do not sell the immunizing peptide. We would suggest looking at the following reference, please take a look at it: Mol. Cell. Biol., 22 (11): 3905-3926, 2002. We will correct and update our datasheet with this new reference very shortly. Thank you for bringing this matter to our attention.